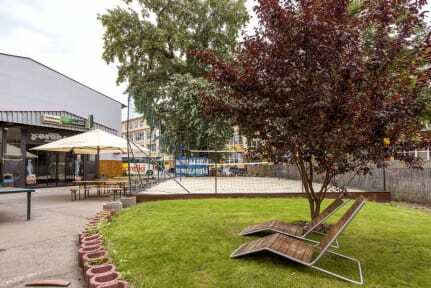 PLUS Prague is a recently-renovated hostel in Holesovice with modern facilities and 'big and sunny dorms', according to our guests, who say it's 'about 15 minutes by tram to get into town' from this hostel. Our visitors have praised the staff highly, saying they are 'extra friendly and will help you at their best if they can' with tips on 'shortcuts and places of interest in town'. Many of our users say that because of the many groups staying here, it's easy to meet 'plenty of people to explore Prague's wonderful nightlife' with. We like their free sauna and seasonal indoor pool. Just a short ride on the tram from Prague's stunning historic city centre, we boast a free sauna & indoor saltwater swimming pool open year-round to sweat off some of that fantastic Czech beer! We're also proud to be the ONLY Prague hostel with a fitness center. Our rooms are big, bright and airy with huge windows to let in the Czech sunshine. Better yet, all the rooms have an ensuite shower and WC. There are free crisp white bed linens and cozy duvets. Our on-site restaurant serves up delicious and affordable meals, and an awesome bar to party with people from all around the world. Unique to PLUS Prague is 'PLUS Girls'. This 'girls-only' space allows you to forget you're a backpacker and be a girl again. There are big bathrooms, cosmetic tables with large mirrors, and hairdryers. When you check in you'll receive a nice fluffy towel to use during your stay with us and a complimentary cosmetics bag stuffed with goodies for you to take along. Additional info: Check-in is from 3pm and check-out is by 11am. The maximum length of stay in a dorm room is 10 nights. If you wish to stay longer than 10 nights, please speak with us and we can organize an offer for a private room. We can accept Euro notes (NO COINS) for final payments for your bed at the hostel and change will be issued in CZK. This will be at the rate set by the hostel and may differ from the rate when you paid your deposit online as market rates fluctuate. We also accept all major debit and credit cards. Please note that children under the age of 16 may not stay in shared dorms (unless the whole dorm is booked for that party). Small pets must be confirmed in advance by email and can only be accommodated in private rooms. I stayed at Plus Prague with some friends from England to celebrate my 50th birthday and John's 60th birthday. We had two rooms with four bunk beds in each, we had a toilet and a shower in each. All the facilities were clean and functioning. We made use of the bar in the morning for breakfast and at night for beers;we enjoyed playing table tennis and pool. We all had lots of fun and all agreed it was the perfect accommodation for our trip. I would recommend it to anyone. This is a clean, affordable, well organized hostel. The staff, especially Jerry and Graham, are very professional & friendly people who are on top of things. Great vibe. I am impressed with how well-managed this hostel is, and how good the facilities are, especially for the volume! It is very well managed & has great facilities. I would definitely stay here again & recommend it to others. Thank you, Jerry & Graham & everyone on the staff for being totally awesome! Had a great stay, unfortunately pool and sauna were closed but apart from this no real complaints. Its far but its really nice! Staff are not very nice, like everybody in the city. The bathroom didnt have a lock on the door and the shower needs an adjustment. The place os a bit far from the center and the facilities, wich is a pool, is cold so you cant use cause the weather is 4° celcius. The rooms were spacious, and cleaned everyday. But I think a lot of people, who don’t stay in the hostel come and use the lobby everyday to sleep on the couches or use the internet. The hostel was pretty much of a disappointment! Rooms, bathroom were not clean. There was almost no power socket near the bed. The area was too far from the city centre! Staff were not bad. Overall can’t recommend this to anybody at this price! We could do some better place!